Announcing the New Common App Essay Prompts - Same as the Old Ones! It’s fun having good news to report on the college front: the Common App essay prompts for the coming season will remain the same as they were this year. I’m a big fan of these prompts, and once you go through them, I hope you’ll be too. Why do I like them? Simple. The questions are varied enough and broad enough to spark all kinds of introspection, personal stories, and opportunities for students to reflect on what matters to them. They do not invite “resumé summaries” but inward glances and leaping off points. And though most students are intimidated by having to do these essays, they often find that once they start writing, they have more to say than the 650-word limit permits. Take a look at the prompts and see what you think, but don’t feel you should start writing anytime soon (today is March 23rd). You’ve got time. The earliest most students will have to submit essays is November 1st – though please be mindful of earlier submissions! If you finish your essay in April, when you look at it again in October, seven months later, you might feel it no longer captures what you want to convey about yourself. For the time being, just read them over and see what you think. And remember: you only need to write one essay, not seven. 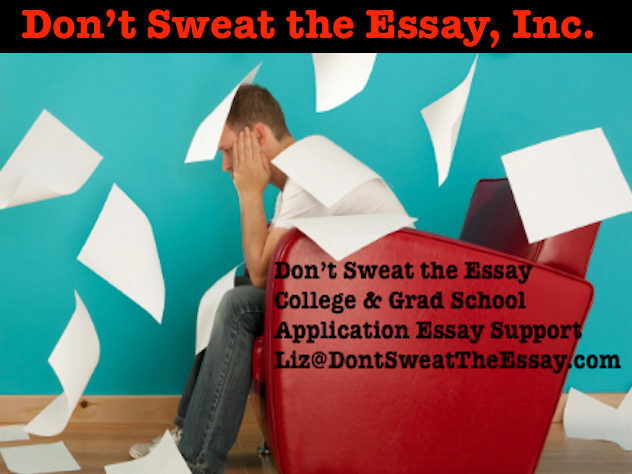 If you’ve got questions or concerns about the essays or the process of applying to college, please shoot me an email or call: Liz@DontSweatTheEssay.com ~ 1-855-99-ESSAY (East Coast US).